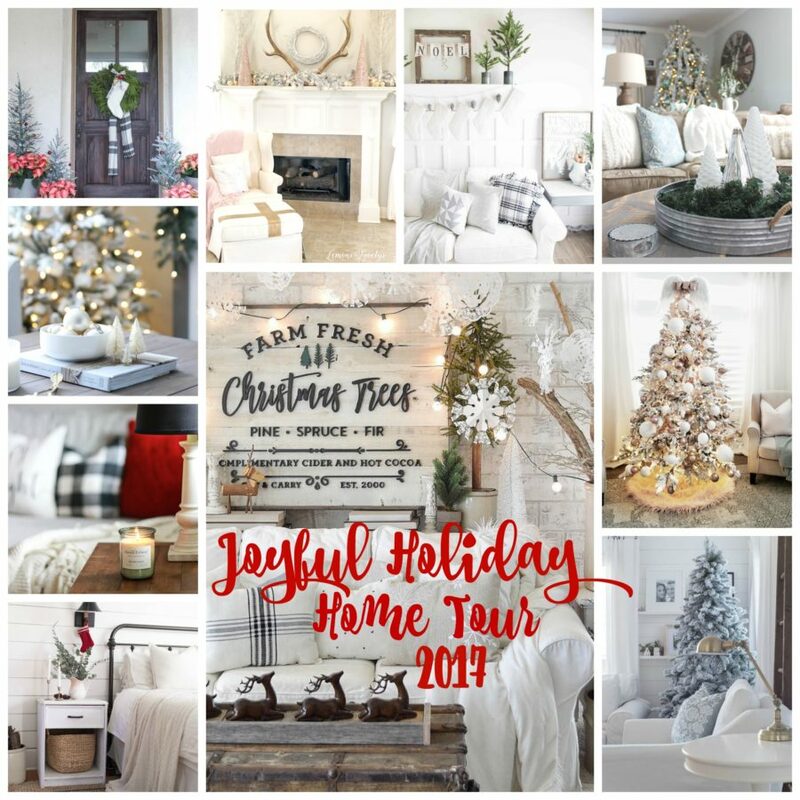 I can’t believe that the time has come to share my Christmas living room tour with you! if you missed part 1 and 2 you can link to them below! 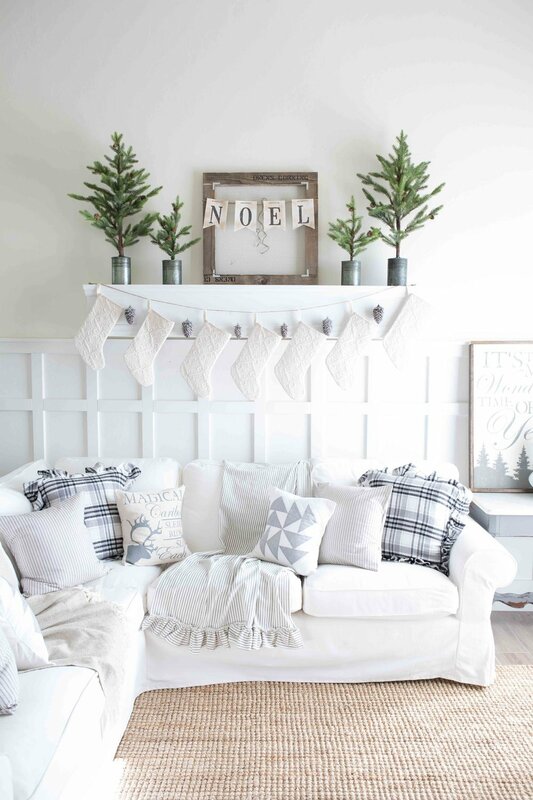 I have also teamed up with some amazing bloggers who are also sharing there Christmas homes today so be sure to find the links to there amazing homes at the bottom of this post. 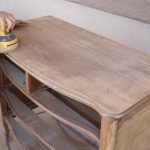 I am preparing in advance but the day this post goes live will be the day before we welcome our 5th baby into our home! Tomorrow we head to the hospital to deliver this baby who’s gender we have left a surprise until delivery! I am all kinds of anxious and excited to finally know one way or the other and to be on the other side of the OR. It’s funny how you make plans in life and then life happens and your things take a course you wouldn’t have ever asked to walk down. I’ve mentioned briefly on my Instagram page that this pregnancy has been a little rough. We were diagnosed with complete placenta previa at our 20 week scan. I know all to well the anxiety and struggle this diagnosis entails because I had this same condition with our previous baby girl. It meant we had to deliver 4 weeks early she spent 10 days in the NICU and I had some complications in my 3rd trimester that took away from the excitement of delivery. We were so blessed with our outcome last time. While we spent more time in the hospital than normal, we took home a healthy baby girl (her gender was also a surprise at delivery too!) As I prepare for this delivery I am filled with the same excitement to meet this baby yet anxiety knowing that with this diagnoses it means complications could arise which I have tried very hard to shove to the back of my mind and try not to think about too much. We are saying many prayers that things go as smoothly as last time and we get to bring this wonderful little blessing home soon! I anticipate we will spend a little time in the NICU again since this baby will also be 4 weeks early but its a small price to pay for healthy Mom and baby! If you’d like updates on how things go and the full reveal of this surprise baby be sure to follow my insta stories over the next few days, I cant promise I’ll feel up to updating right away but you can bet I’ll share something in the next day or two! The funny part about this baby is they were actually due on Christmas!!! I laughed out loud when my nurse told me my due date! As fun as it would have been to have a Christmas baby, I am excited to know that we will have this baby here and enjoying him and her throughout the rest of this Christmas season! I tried hard to convince my husband to use some sort of “Christmassy” first of middle name, he was so not on board!!! But ” I think, MAYBE” we have agreed on names!! lol its so much harder when you don’t know if its a boy or girl!!! We struggled last time too and didn’t agree till the final hour before our little girl arrived!! The funny thing was we were struggling with a boy name and ended up not even needing it! With our twin boys and our first daughter, we found out the gender at our 20 week scans, and we had names set in stone when we left those appointments! I guess leaving the gender to be discovered at delivery means the name kind of ends up being a surprise as well! Now that I’ve filled you in on the big event happening tomorrow lets talk a little more in-depth about my Christmas living room. I started decorating the week of Halloween. I knew I had an impending due date that meant I had to be on the ball this year! Thankfully I already had some beautiful pillow covers and a quilt made by my favorite shop Little Bits of Everything to help get me started! I decided back in July that this year I would take a less traditional route and go for a gray white and tan color scheme. I have loved the way it has all turned out this year and I know I say it every year but this year its my most favorite of all time! I also decided to whip out my sewing machine after letting it collect dust for the last few years! You might not know but my first blog I started with Rachel @ little bits of everything was all things sewing and crochet!! 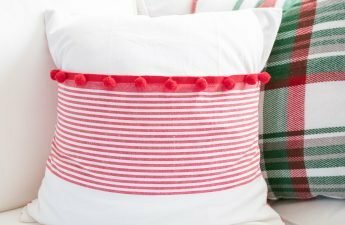 I decided after one too many fights with my sewing machine I was just not cut out to be a quilter but, small projects like the pillows and throw are about all I can handle but they sure make for pretty and affordable d?cor! 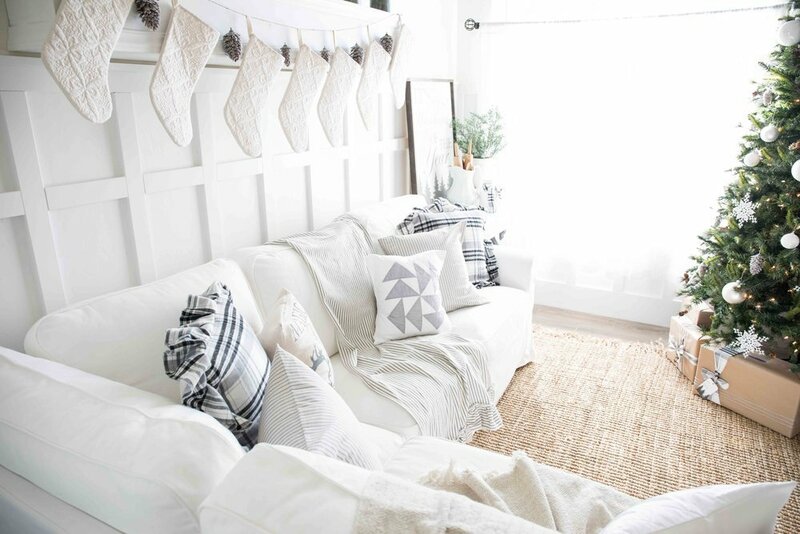 Be sure to check out the 4 pillows and the throw tutorials below so you can make your own! Once I got the pillows all sorted I knew I needed to figure out something for the mantle! 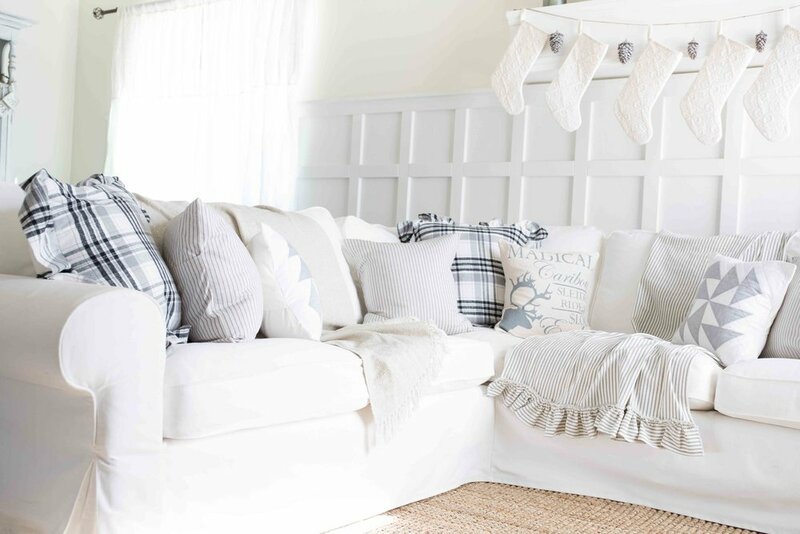 Here is where I added a few knew items to my Christmas d?cor collection! 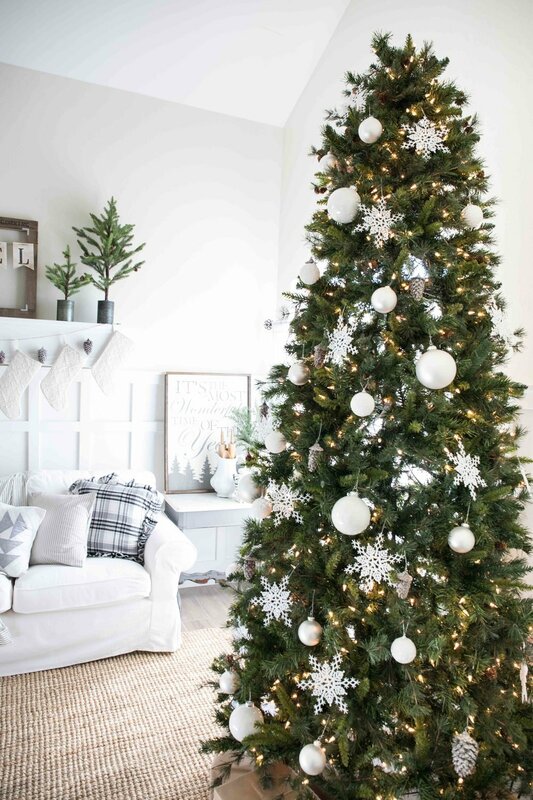 I got these adorable trees from Hobby Lobby and I love this type of d?cor because I already know I will be able to use them somewhere else next year! I find I have a hard time justifying d?cor purchases that are only going to be relevant once. These tree’s will get great use! Not to mention they were 50% off at the time that I purchased them! 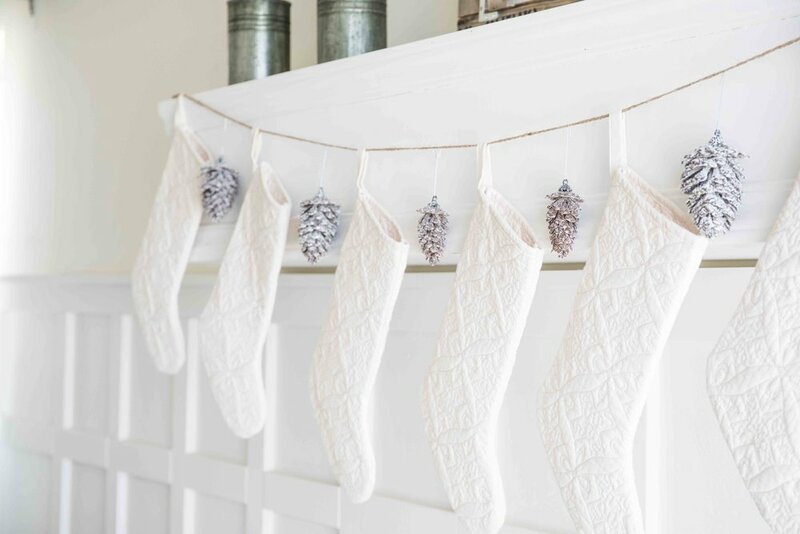 Rachel made these quilted stocking for me several years back and I simply strung them up with some twine, a great way to avoid putting multiple holes and hooks in your mantle. Speaking of mantles you can find the tutorial for this one HERE. 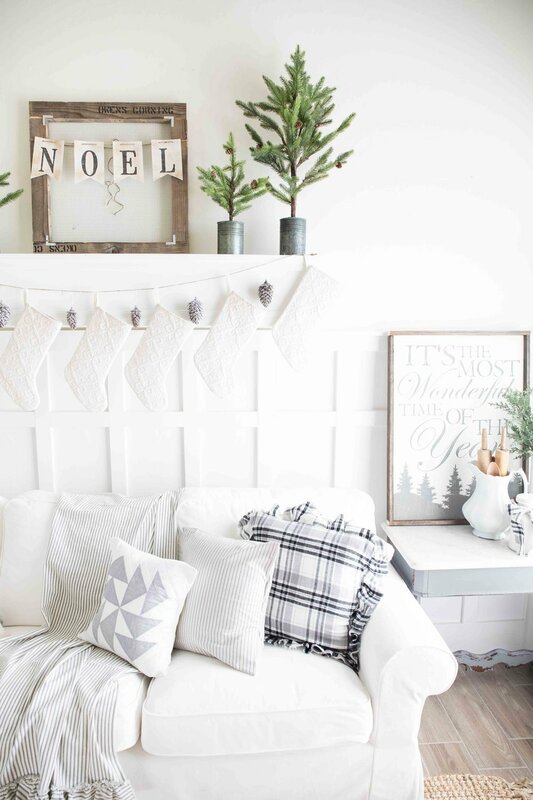 I then used some frosted pine cone ornaments form Hobby Lobby and the Noel banner and frame were hand made! I have a tutorial for the frame here. The tree. I knew it was time for some new ornaments tis year! 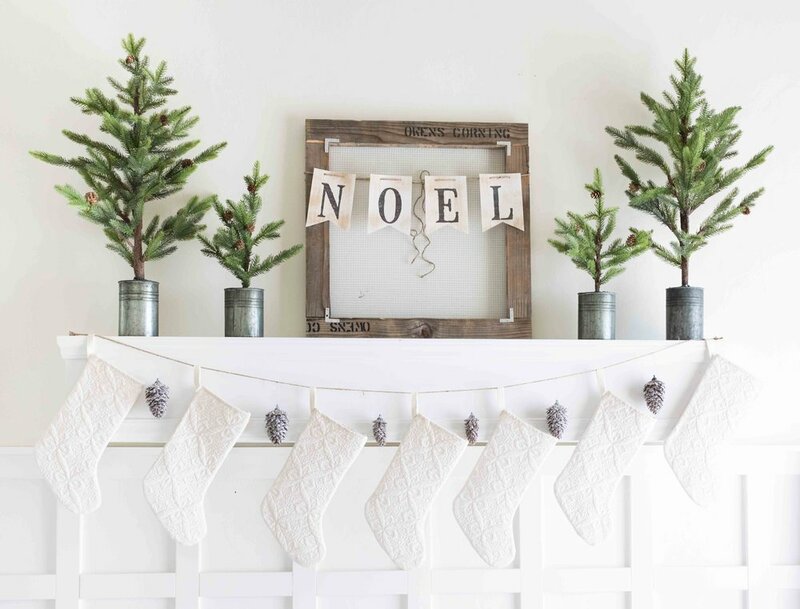 In years past I’ve used the same ones over and over and even made quite a few DIY ornaments. 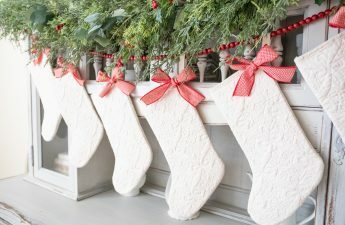 This year I just picked out some white ones form Hobby Lobby and kept is really simple! 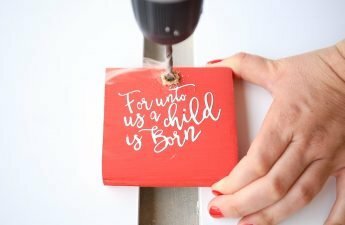 The wrapping on our presents is all chronicled in this video of unique ideas and ways to wrap this holiday season!? 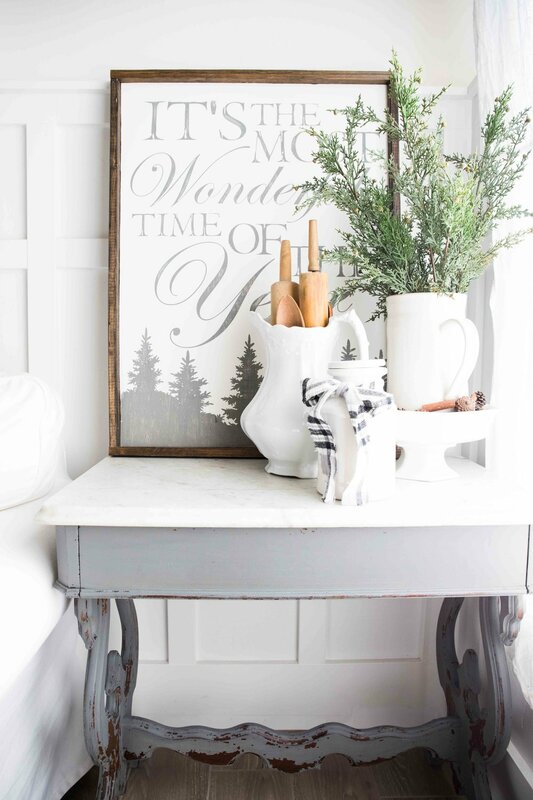 The side table was the final item to come together I made this sign and shared just how to do so HERE and then filled some of my favorite pitchers and white ceramicware with holiday picks!! 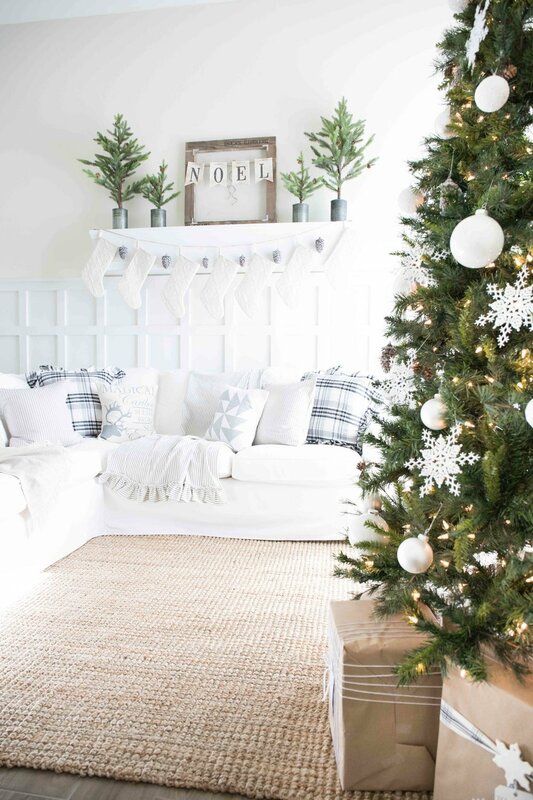 I hope you enjoyed my Christmas living room! 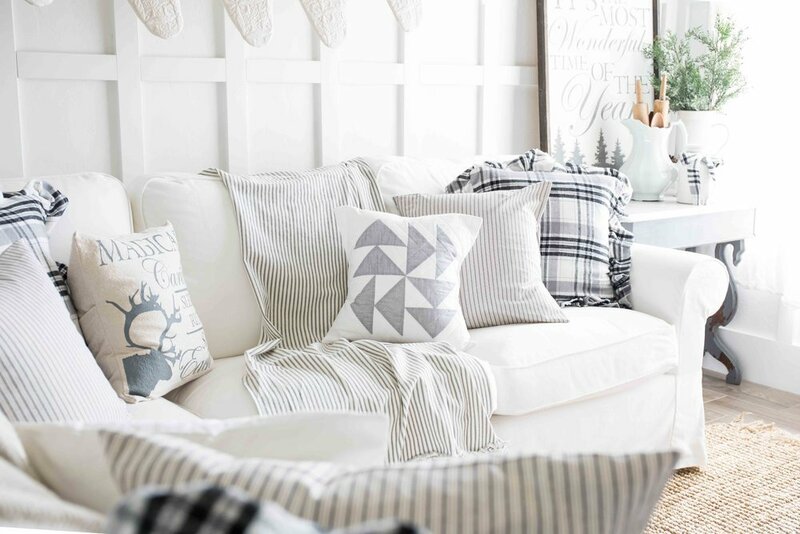 be sure to check out the other amazing bloggers homes below! I know that’s exactly what I’ll be doing as soon as I drop my sweet kids off at school today!!! Haley your home looks gorgeous!!! I cannot believe you pulled this all together right before you give birth! You are amazing!!! Thanks for doing this tour with us! I just loved your bright airy tour. 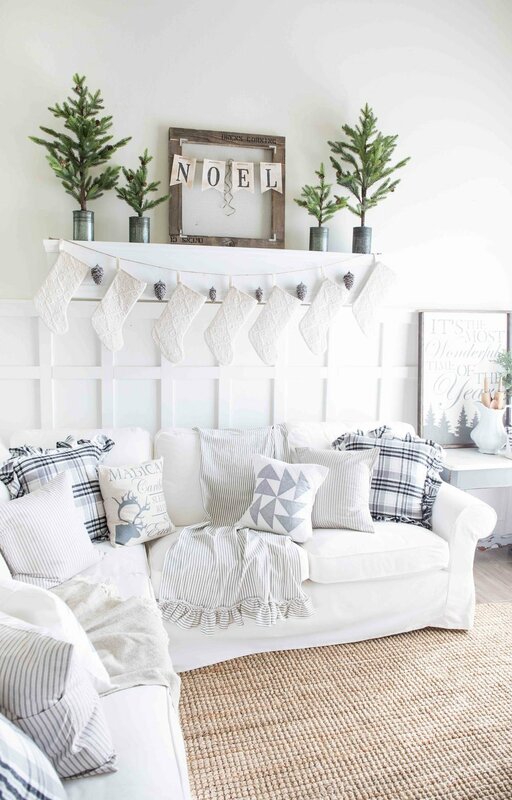 Your tree is simply beautiful and I that board and batten wall with stockings is lovely. Good luck on baby! Oh my word Haley! This is just so beautiful! As usual! This is all so beautiful! 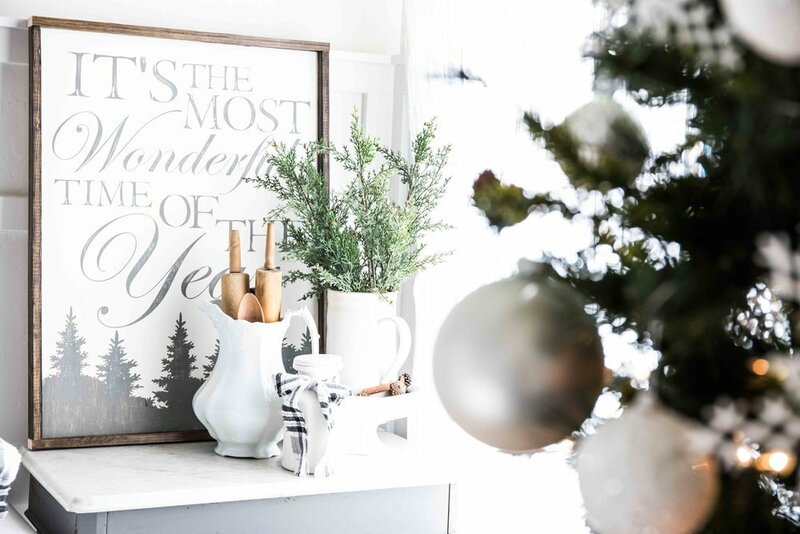 I love everything about your Christmas home! Hayley I always love your home, but Christmas may be my favorite. 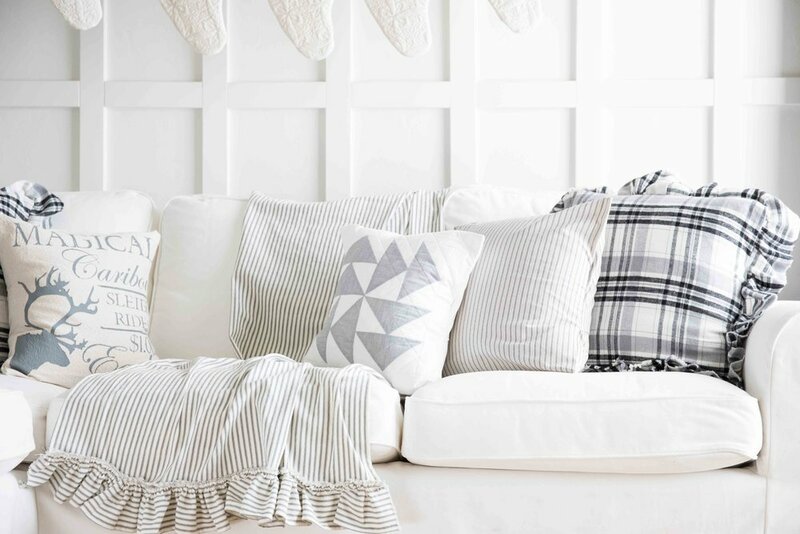 Those ruffled pillows are amazing! How coincidental I was just telling one of my patients today about the signs you made for me as she is venturing into similar business here in Indy. 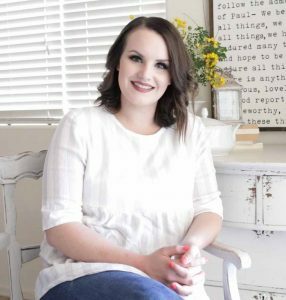 I tracked you down so I could share your website with her and found out you have branched out to even more amazing things. Many blessings for your 5th child and hope and pray that all went smoothly. Haley, Everything is so gorgeous! 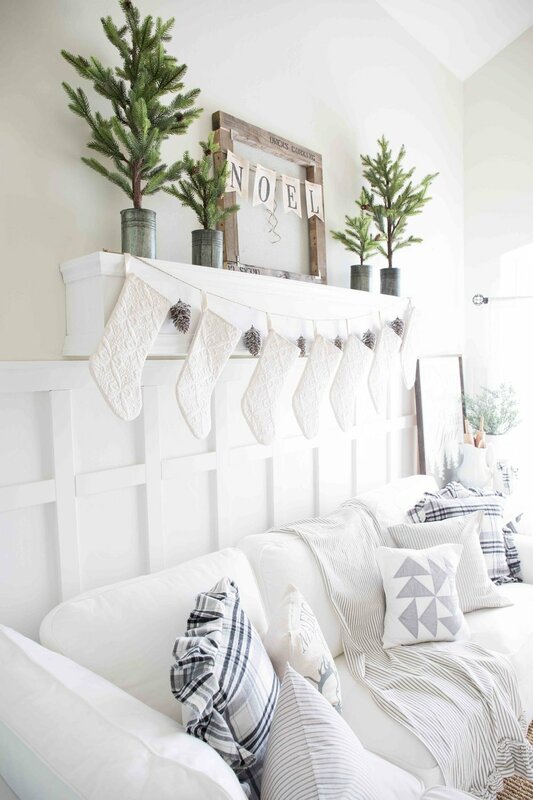 Love the little pops of trees on your shelf. I hope everything went great with your delivery!